The familiar holiday decorations are up in downtown Santa Barbara, but their glow has been dimmed not only from smoke and ash, but a collective sadness from the town's inhabitants. The streets are empty of happy shoppers and tourists visiting paradise. I've been aware for some time that paradise is relative. A seven-year drought may present sunny blue skies giving the impression of perfection, but no nourishment for its vegetation and wildlife presents dire results. Beginning on Dec 5th, I was sequestered for five days in my small space while the Thomas fire raged nearby. I took the advice of keeping windows shut, and wearing a mask outside. For the first time in my life, I walked around running errands with a mask secured to my face. As I observed my fellow SB residents, a few without sunglasses revealing panicked eyes darting about, I felt the impact of an emergency situation. I'm sure my own eyes were a combination of fear and despair, although one of my eyes was bright red from a broken blood vessel after an ash particle made its way in. 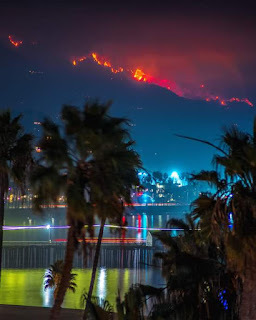 To notice everyone in masks while smoke suffocates Santa Barbara and ash falls like snow; Armageddon comes to mind. Millions of ash specks containing fragments of trees, homes and personal belongings; animals who couldn't escape, all blanketing hundreds of thousands of acres from Ventura to Santa Barbara. It's so overwhelming and brings up feelings of helplessness. What have we done to our environment? Climate change has given us warning signs, but it's always easier for many Americans to wear blinders and jump in their gas guzzling SUVs. I've been an activist for the environment and protection of our wildlife for more than thirty-years. We are fortunate to have driven people and organizations around the world devoted to the cause. It's a speeding train though. This last year severe hurricanes crashing in anger, as well as fierce fires have destroyed hundreds of thousands of acres; taking out homes and killing people and animals are gargantuan flashing warning signs! As our masks run across our faces, the White House is too busy serving the rich and corporate polluters to take strong action. Everyone talks about keeping those prayers going whenever a natural disaster occurs. It drives me to madness. I respond by saying, 'sure, keep the prayers going but it's crucial to take action'. I'd prefer to see a post response to the various natural disasters about a petition that was signed, representatives that were called; exhibiting dedication they have to their part in healing the planet. The irony is that a divine power created our planet in the most intricately and astoundingly beautiful way, and it's human hand that's destroyed it. I can't imagine a better way to honor victims of a natural disaster and the Divine Creator than making the care of our planet a priority. The Thomas fire has cost well over a 150 million dollars, and more than eight thousand firefighters working to put it out. Staggering. If great strides had been taken and government funds toward reversing climate change began decades ago, the strain of state and federal funds for the multiple disasters occurring would be better spent. But this would be challenging for the short sighted greedy people of power to look at the big picture. Initiating a long term plan for the health of our planet and all that thrive here seems like the most logical and smart action to me and the majority of others living and breathing on earth. But it's too much to ask of narrow minded talking heads abusing power. We need brilliant thinkers and progressive visionaries in seats of power. Through the generosity of a good friend, I drove north a hundred miles to San Luis Obispo with my red eye and migraine. When power began to go out in my little place and I no longer had a fan or air filter to keep some form of air flowing, I felt like a trapped animal. Stress increased and claustrophobia took over. All my doctors tell me I need to heal and PTSD is common for all I went through during a four-year breast cancer journey. I could feel myself becoming triggered and there was no air to breathe. It took my friend saying, "Get out" before I realized the intensity of the situation. But I felt guilty leaving. I worry about everyone dealing with the fire, animals that can't be saved, the glorious Santa Barbara mountains and hills, landscape, and majestic trees. I returned home December 15th where black ash floated and a gloom covered the town and people. I was sealed in and when I woke the following morning and walked to my little living room with a big picture window, Dorothy of Kansas came to mind. There was a fast rushing of smoke flying by at 40 mph. I stared, trying to wrap my head around what I was seeing. I was barely awake and hadn't had strong black tea or espresso yet. Was it brown fog? No, it was smoke and the winds had picked up to 65 mph in the hills while I was sleeping creating an extreme turn for the already fierce fire. I was terrified. Everything in town was cancelled. My volunteer duty that day for State Street Ballet's performance was shut down when the Granada theater was on possible evacuation. Further mandatory evacuations went into effect and all of us were on voluntary evacuation. No one could say where the fire would go next. And, hazardous air was unavoidable. Anxiety was palpable. Because of a longtime friend I met at college (fashion institute) seeing my posts and fire worsening, she contacted me from the east coast wanting to see me safe. She and her daughter funded my second departure. I left again for the same welcoming Lodge in SLO the following day with my mask, migraine, blood shot eyes, and broken heart. My small white car was black with ash and soot. I went to a drive through car wash so I could cleanse the blackness before racing to 101 North. When I came out, a fire truck was in front of me. I drove by, stopped and looked up to the fireman behind the wheel. I put my window down and said, "thank you". He nodded with a "you're welcome". I closed my window to keep the flying ash from joining the accumulated ash inside my car for several days, and began my exodus as I broke out in tears. Fifteen days later and the fire is only 50% contained. Firefighters sense some control now, but not expected to be fully contained until January 7th. Dry sundowner winds are expected this evening through tomorrow. There's no rain in sight to assist the fire fighters and rinse away the black rage of this relentless fire. Holidays are getting close but a bright celebration of joy feels odd. Our brave firefighters and emergency workers are my sparkling moments of gratitude and beauty in the face of a monstrous fire and fear. I think Christmas is about warmth and connection. I feel so incredibly blessed to be deeply connected to my awe-inspiring and generous friends; to all involved in fighting the fire and to my valiant community of Santa Barbara. I will make efforts to stay grounded and smile with a warm hello to everyone I come across in local businesses, whomever I pass in the street, and thank our heroic firefighters every chance I get. The holidays seem surreal in the face of all this devastation, but I'll find holiday spirit to share where I can.